Do you have a sweet tooth that can only be remedied by a trip to a candy shop or a dive into a decadent dessert? That’s an easy problem to fix when you’re visiting the Smokies, because fudge, candy, and amazing desserts are staples around here! 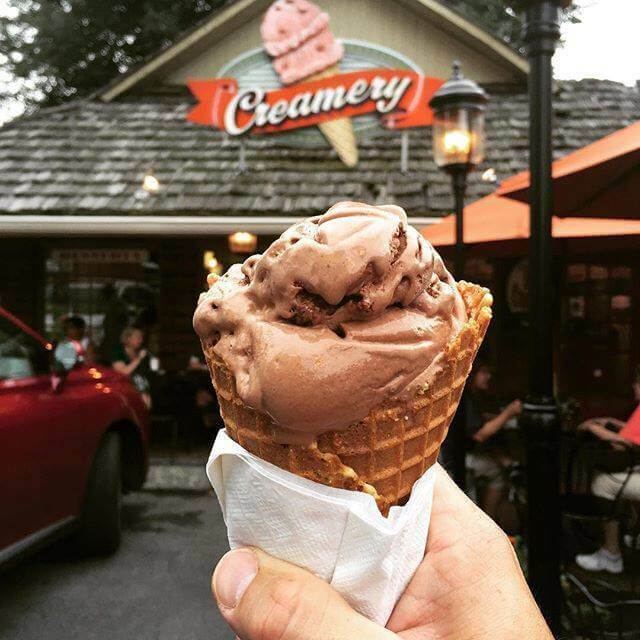 Whether you want to watch your dessert being made, or want to shop by the pound, we have a sweet list of 10 delicious stops for desserts in both Gatlinburg and Pigeon Forge. There are two locations in Gatlinburg, but the one we want to focus in on is the flagship location in the Mountain Mall. 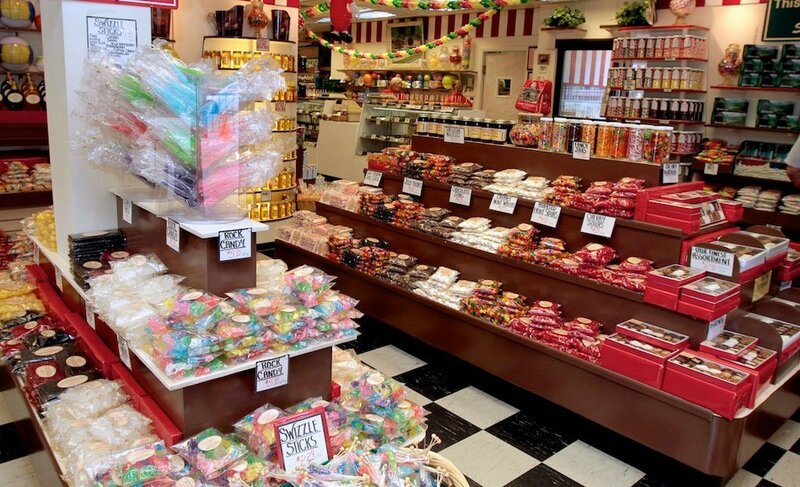 Since 1939, Aunt Mahalia’s has offered Gatlinburg visitors yummy candies. You can find fudge, candied/caramel apples, logs, brittle, and taffy in the shop. They also offer sugar-free options, honey, syrups, and jams. If you miss this shop on your trip, they have nearly everything online and available for order. However, they don’t ship to some locations, such as Alaska and Hawaii. Okay, so technically you could also visit Mad Dog’s in Pigeon Forge, but if it’s not Friday or the weekend, then stop by their newer location in Gatlinburg. It’s on 321 between downtown Gatlinburg and Glades Rd. and is open daily. Bring Fido along, because they also have doggie treats and toys, plus water bowls outside. 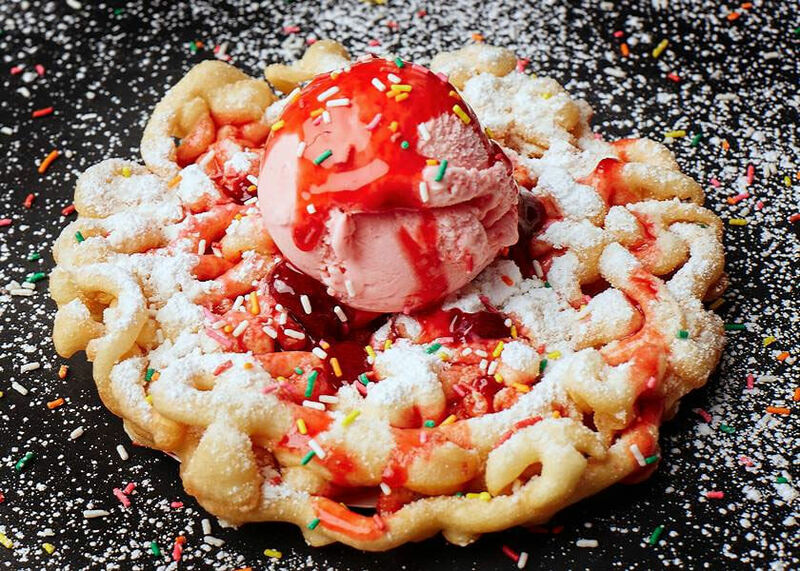 Mad Dog’s Creamery offers hand-dipped ice cream, soft-serve sundaes, milkshakes, funnel cakes, and donuts. Check out the Mad Dog’s Creamery page for a look behind-the-scenes. This Gatlinburg staple has been serving up delicious homemade candies since 1950, when it was opened by Dave and Peggy Dych. They sidelined their dreams to make it big in California once they saw how awesome Gatlinburg was! Buy a piece of candy or indulge in a whole box. They serve fudge, taffy, chocolates, brittle, and other sweets. They also have some unique offerings like Ole Smoky Moonshine flavored taffy! If you need a fix after you get home from your visit, you can also find their candies available on their online store. You can check out the location next to the Pancake Pantry after a hearty breakfast, or westward down the street at 744 Parkway. We warn you, it might be a struggle to not let out your belt, because you’ll be passing by the Fudge Shoppe of the Smokies, the Caramel Candy Company, and Mayfield Dairy Bar on the way. Sometimes you need to mix a little sweet with some breakfast items, which makes the Pancake Pantry in Gatlinburg an excellent choice. They’ve been in business for decades and offer decadent foods like Swiss chocolate chip pancakes and wildberry crepes with ricotta and cream cheese. 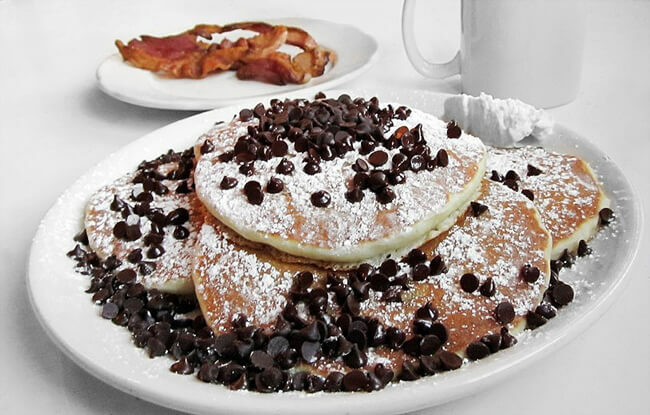 Kids will love the M&M pancakes, sprinkled with powdered sugar. 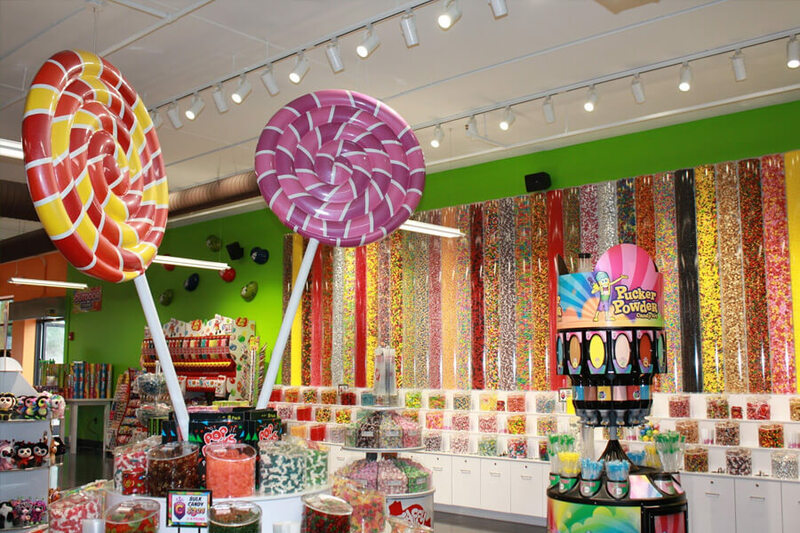 A downtown Gatlinburg attraction is probably not something you’d correlate with candy, but you can’t miss the candy because you’ll be surrounded by it as soon as you step in the building! There are literally hundreds of candies available for purchase in bulk and they also have Pucker Powder for those who need a serious sugar fix. It’s pixie stix on steroids! Whether you need a giant drum of Toxic Waste Candy or a giant foot-long gummy snake, this shop offers it all. You can get homemade fudge, candy apples, and chocolates, or find plenty of options at their bulk candy bins and displays around the store. They also have gelato and gourmet popcorn to indulge in. Nothing quite goes together like gumdrops and mini-golf—especially at Crave Golf Club. 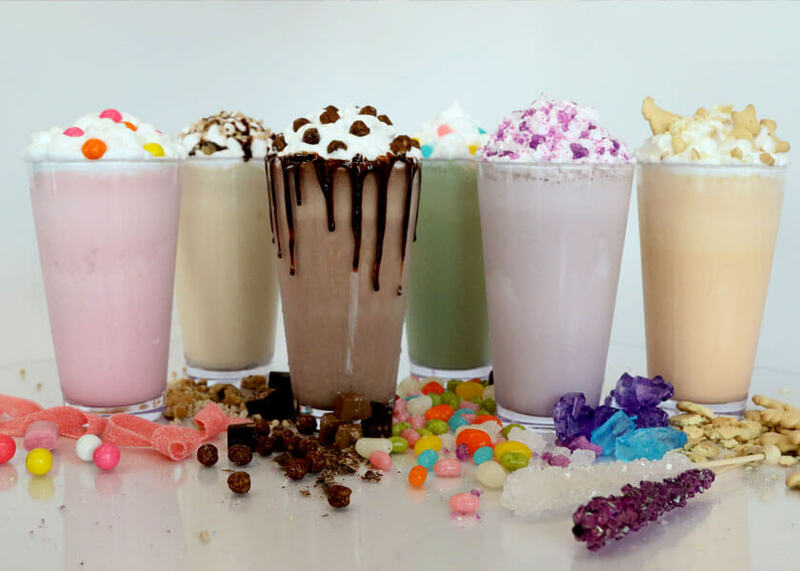 Your eyes will enjoy the candy-themed golf course, and your taste buds will go nuts over their specialty milkshakes, such as rock candy mountain, ice cream canyon, and cocoa cliffs. You can come up with your own milkshake mix-up if you feel daring. 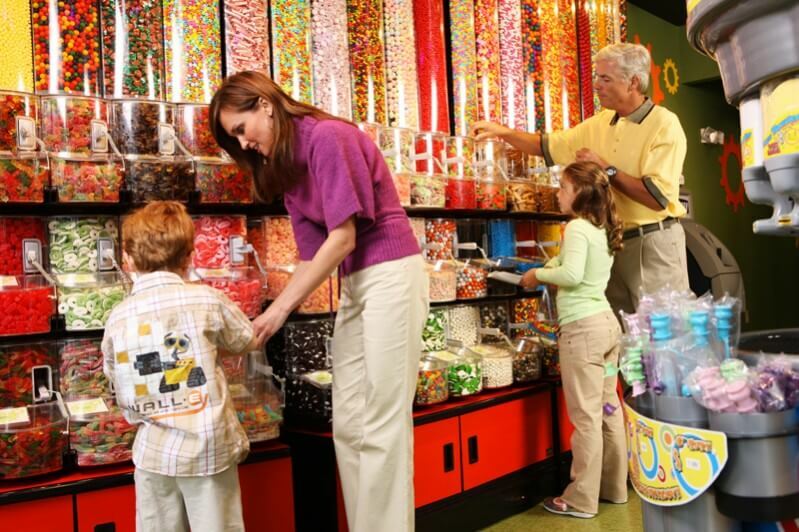 Next to the milkshake bar is their sweet shop with rows of bulk candies and chocolates. Sister store, TopJump, also has a huge selection of sweets, including a candy wall, if you want to pair an attraction with sweet munchies. 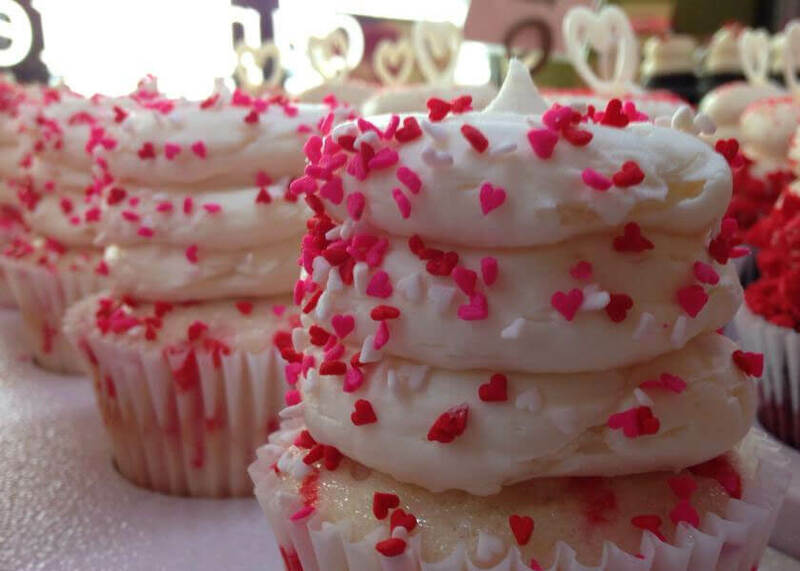 This is not your ordinary cupcake shop! They have gourmet style cheesecakes and cupcakes with mouth-watering flavors like chocolate chip cookie dough, chocolate peanut butter pretzel, and peppermint hot chocolate. Triple chocolate torte and wedding cake cupcakes are available gluten-free. They also create amazing cakes. 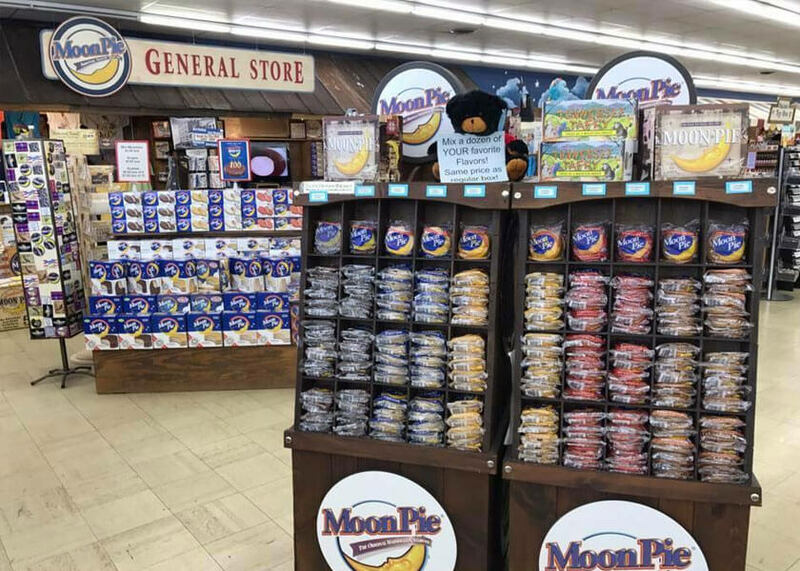 This store is a moon pie lovers dream! They offer probably the widest selection of moon pies fresh from the Chattanooga bakery that you will ever see. Plus they have bulk candy, jams and jellies made in the area, Tennessee taffy, honeys, and more. Enjoy a shake, malt, float, or ice cream here. They offer traditional ice cream flavors like butter pecan, chocolate chip cookie dough, and cookies and cream. For those who want a little kick, try the whiskey ribbon, made with moonshine from the Old Forge Distillery and laced with fudge. 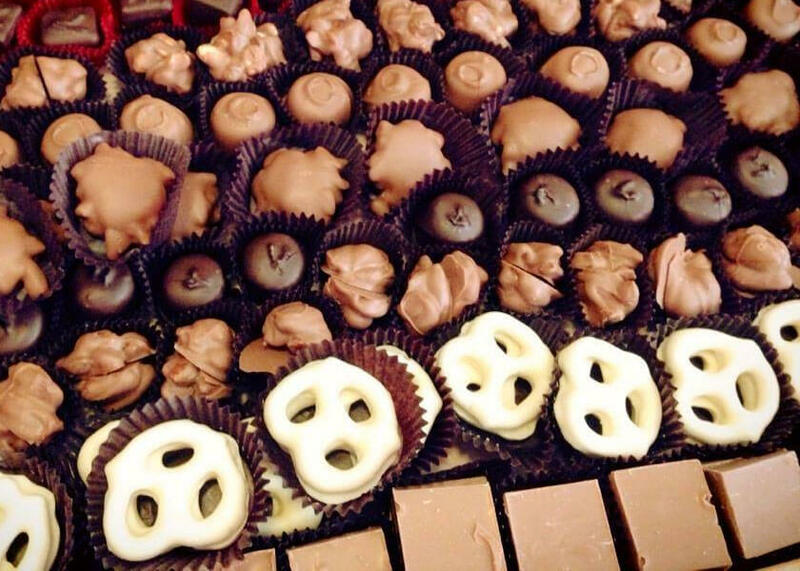 Next door you’ll find the Old Mill Candy Kitchen full of fudge, bulk candy, hand-dipped chocolates, and taffy. Besides this list, you can check out the Desserts and Candy page under “Things to Do” and our section within brochure categories. You should also add Glades Soda Fountain on Glades Road in Gatlinburg. They can make you almost any ice cream related that you can dream up. The owner is awesome, too. Chocolate monkey in gatlinburg is our favorite stop. You need to try 3 Bears for the wonderful candy. Always buy the fudge when we’re in town. Take some back yo Alabama for our son. Also the Apple Barn has a great sampling of anything you can imagine. Something for everyone. The Apple Barn Creamery has some of the best ice cream I’ve ever had! HERE’S THE SCOOP! We have a full selection of hand-dipped premium ice cream cones, sundaes, banana splits, floats and the best handmade milk shakes in town. Mad Dog’s has added delicious espresso drinks, shakes and affogatos.